Dimensions 1 by 6.30 by 9.30 in. "Seth Hettena skillfully weaves many threadsâmost fresh or previously hiddenâinto a rich tapestry tying together decades of Donald Trump s deep involvement with Russia." Is the 45th President of the United States under the control of a foreign power? Award-winning Associated Press reporter Seth Hettena untangles the story of Donald Trumpâs long involvement with Russia in damning detailâincluding new reporting never before published. As Special Counsel Robert Muellerâs investigation into the relationship between members of Trumpâs campaign and Russian operatives continues, there is growing evidence that Trump has spent decades cultivating ties to corrupt Russians and the post-Soviet state. 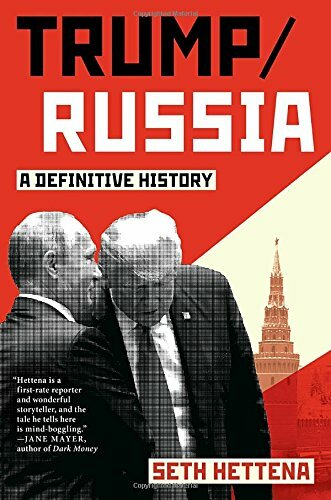 In Trump/Russia: A Definitive History, Seth Hettena chronicles the many years Trump has spent wooing Russian money and power. From the collapse of his casino empireâwhich left Trump desperate for cashâand his first contacts with Russian deal-makers and financiers, on up to the White House, Hettena reveals the myriad of shady people, convoluted dealings, and strange events that suggest how indebted to Russia our forty-fifth president might be.